Tasting notes: A story of coffee. Real tasting notes included. Brighter aromas of the emergence of a new farmer and international investment. The pleasant mouthfeel of a unique and complex journey, with a bitter aftertaste of geopolitics. British colonists brought coffee to Myanmar in the late 1800s, most of it historically consumed in-country or in China and none of it remarkable. That changed in 2015 thanks to the diligence of a new generation of coffee farmers, many of them women, and subsequent investments from non-profit organizations, including in the coffee industry. By 2017, Myanmar coffees were finally achieving noteworthy scores in competition. You can find Myanmar coffees at select coffee retail shops. Atlas (headquartered in Seattle) is the only importer bringing these beans into the U.S., and I’ve seen them carried by Blue Bottle and, locally for me, Portola Coffee Roasters in Orange County, CA. Plenty of other retailers carry Myanmar coffees, including Whole Foods, and given the growth rate, they’ll continue to appear in many specialty coffee shops. Because of climate change, disease, and similar factors that make it increasingly challenging to grow high-quality coffee at the traditional sources during a time where specialty coffee consumption is growing unabated, the emergence of coffee in Myanmar is both timely and promising. 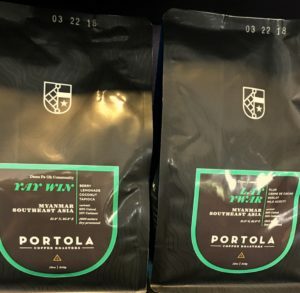 I had a chance to sample two offerings at a recent workshop and tasting at Portola Coffee Roasters (it won Roast Magazine’s 2015 roaster of the year award). I’ll take any chance I can for a social activity around coffee, not to mention the notion that I’ll be able to learn by asking questions of Portola’s head roaster Adam Rizzo, nerd out with fellow coffee enthusiasts, and further push my palette, which is admittedly still in its developmental stage. Finally, I was drawn to the idea of understanding the impact of politics on the coffee industry, given what many of the people in Myanmar are currently enduring, and while I didn’t get the answers during this workshop, I came to find them further in my research. 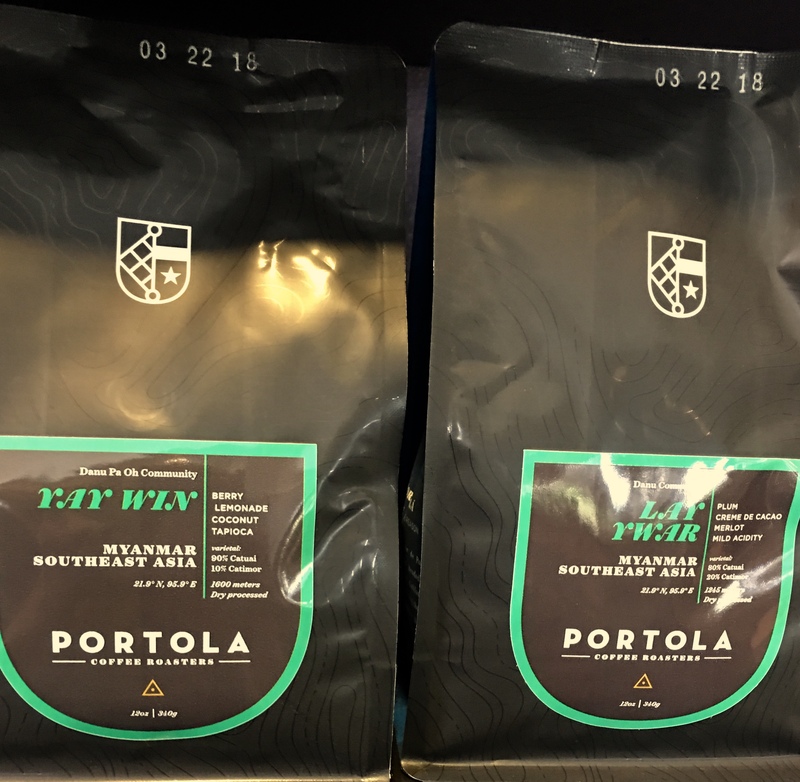 Portola representatives have traveled to Myanmar, and two of the coffees the company targeted were from Yay Win and Lay Ywar. Adam Rizzo brewed us samples in batch using a Chemex pour over (both paper and metal filter, for the coffee geeks). The Yay Win is grown at 1600 meters above sea level (msl), and it’s a relatively small harvest produced by 43 cooperating farm families. After picking, the coffee is processed naturally rather than using a washed process (more on that further below) and is consequently a bit more fruit-forward and slightly more acidic. Rizzo said that we might taste under-ripe strawberry or perhaps perfectly ripe raspberry. He said that as it cooled, we’d taste sweet lemonade. The packaging lists tasting notes of berry, lemonade, coconut, and tapioca (note to self: must eat tapioca to see if that’s really a flavor). After my tasting, I wrote down “raspberry and a hint of dark chocolate.” It had more body and was more syrupy than the Lay Ywar. The Lay Ywar is grown at 1200 msl by 180 producing families (out of 180 families in Lay Ywar—yes, all families produce coffee). This is also a natural (or dry) process coffee, but the acidity was a little bit lower than with the Yay Win, which made the fruit notes more pronounced and the coffee perhaps just a bit sweeter to me. I wrote down “tropical punch” and noted that this coffee had more brightness. The package tasting notes: Plum, Creme De Cacao, and Merlot. If you’re a fan of Ethiopian naturals, you’ll also enjoy these coffees, although I typically taste much stronger notes of blueberry in some of the Ethiopian samples. Myanmar is latitudinally similar (and I realize I’m stretching just a bit here) to Ethiopia, the birthplace of coffee. It’s even closer to Yemen, another early coffee homeland. The climates of those countries are much different, of course. For example, Yemen is much drier and subtropical, whereas Myanmar’s climate is tropical, with heavier rainfall and intense humidity. Both are prone to larger temperature differentials inland at various times of the year. In Yemen’s Spring, for example, temperatures can range from 15°C (59°F) at night to 35°C (95°F) during the day. Cooler temperatures can elongate the growing process, concentrating the sugars and flavors in the fruit. Much of Myanmar’s coffee production comes from Shan State, with cooler temperatures at higher elevations. But the extreme weather still makes coffee production challenging. Myanmar’s dry season is uncomfortably hot, and winters can drive temperatures below freezing, according to Craig Holt, founder of Atlas. To protect against the heat, growers use shade trees tightly packed together. Holt also said soil is another challenge—the top soil is thin and rests on a bed of magnesium, making pH balance difficult for the farmers. The good news is that coffee dries quicker during Myanmar’s extremely hot season, allowing producers to use a natural process, which brings out those intense fruit notes. Using a natural process is also helpful because the equipment required for washed processing is expensive and not as readily available. Despite some challenges to growing coffee in Myanmar, the climate is right for it, and farmers have been working on increasing the quality for the past several years. To further progress, the Coffee Quality Institute (or CQI—more on this organization further below) developed the Myanmar Coffee Association in the Mandalay Region. In 2015, the Myanmar Coffee Association and CQI held the first cupping competition, working with international development (non-profit) organization Winrock and with funding from USAID. 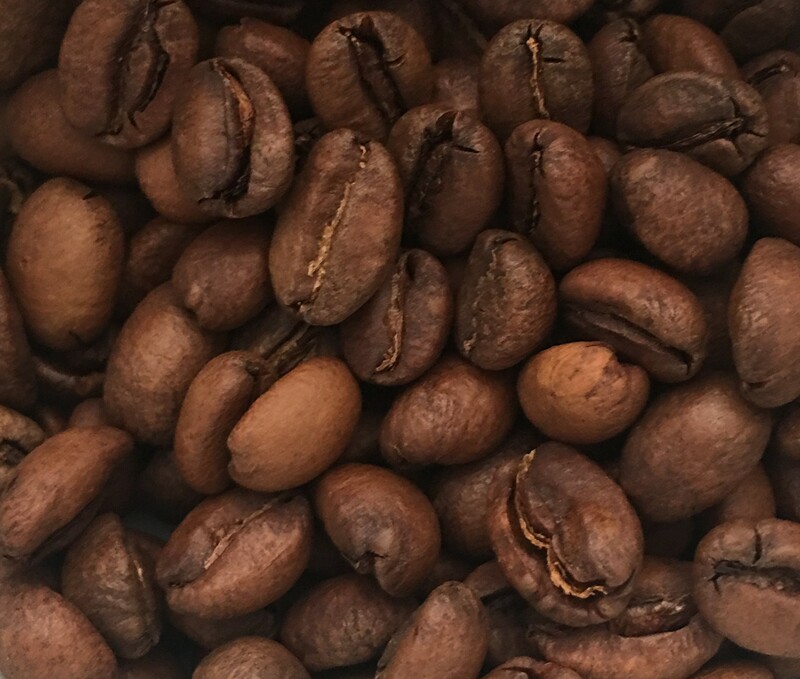 A surprising 21 coffees achieved a Q grade score (again, more on this further below) of at least 80 (out of 100), the first time Atlas’ Holt had seen scores above the 70s. The two highest scoring coffees landed at slightly above 84. In 2016, the numbers were even better, with scores of 87 and 86.75 for the winners, and more coffees hurdled the 80 mark (56 of the 60 entries). In 2017, the news was better still, with winning scores hovering slightly under 90. The competition saw a 150 percent increase in coffees with scores higher than 85. The Specialty Coffee Association, or SCA (there’s a division for America, SCAA, and one for Europe, SCAE), is a non-profit organization whose mission is to foster sustainable specialty coffee globally. It created CQI as an independent entity that provides education, research, technical support (for production and processing), equipment, and training (from agricultural science to business development) to help increase the quality of coffee, both for the benefit of the consumer and the producer. One of CQI’s services is the Q grading system. Coffee evaluators need to be trained on it, and coffee scores are only provided using this system in competition. The process of becoming an evaluator or becoming certified among these bodies is something akin to becoming a wine sommelier. By 2016, Myanmar had five Q graders, according to information on CQI’s website. Naturally, as the quality of coffee improved in Myanmar earlier this decade, more resources were sent, including new drying racks, more oversight and training on the drying process, access to processing and milling facilities, and more. It is difficult to avoid talking about geopolitics when talking about coffee. Our coffee frequently originates in impoverished areas or those torn by political upheaval (or both). Ethiopia is coffee’s motherland, and Yemen (currently enduring nearly constant bombings from Saudi Arabia) follows close behind. Much of the world’s coffee comes from Brazil. Great coffees come from Kenya, Rwanda, Panama, and Nicaragua, not just Costa Rica and Columbia. And right now, it’s nearly impossible to think about Myanmar without thinking of its complicated history of military rule and global isolation. British rule ended in 1948, but the country has been run by the military from 1962 until 2011, with major reforms coming in 2012, followed by the lifting of sanctions by the U.S. and European Union. (The U.S. still calls the region Burma.) Many of these efforts combined to spur subsequent years of economic growth. However, the military still has great power. During the past couple years, the military has been engaged in an ethnic cleansing of a community of Muslims known as Rohingya in the Rakhine State. Some estimates say that as many as 800,000 Rohingya have fled this violence since 2016, mostly taking refuge in Bangladesh. The president, Htin Kyaw, resigned in mid-March (2018), and just last week Win Myint was elected by the government as the country’s new president. Myint, like his predecessor, has close ties with Nobel Prize winner Aung San Suu Kyi, who was a political prisoner for decades. Rakhine State is on the western edge of Myanmar. The coffee that is being imported into the United States (and elsewhere) comes from Mandalay Division, which sits in the middle of the country, and the Shan State, which is on the eastern edge, with China to the north and Laos to the east. It is an important part of our job as importers collaborating with growers to remain aware of the political situation in countries where we work. Although the terrible things happening to the Rohingya people do not directly affect the growers with whom we work, we are cognizant of what is happening there, and sensitive to what it means for people doing business in Myanmar. The ongoing humanitarian crisis in Myanmar raises serious questions for all of us who buy Myanmar coffee. While Atlas is not working in Rakhine State—we work in Mandalay State and Shan State, which are further east—we want to be abundantly clear about why we continue to support smallholder farmers in that country. Many of the world’s coffee producing countries are developing nations facing complex economic, social and humanitarian issues. At Atlas, we believe that supporting economics efforts within the most vulnerable populations (i.e. smallholder coffee producers) can have a positive impact on at-risk communities. Policies of oppression typically originate with—and are enforced by—government and military leaders, not by people working in agricultural sectors. History has shown that withholding economic support from these countries is unlikely to lead to policy reform, and is likely to exacerbate conditions for the very people who most need financial opportunities. At Atlas, we don’t work with governments; we support smallholder farmers. Currently, our work in Myanmar supports two ethnic minority groups up in Shan State—the Pa-O and Danu people. We are supporting communities which have long endured economic hardship. Profit from specialty coffee sales is going into schools, medical facilities, and, of course, households throughout Shan State and Mandalay. These communities have benefited greatly from their work in specialty coffee, and we see no reason to cut off their access to the market because of conflicts in which they are not participating, and over which they have no control. We are continuously evaluating how best to move forward in Myanmar, and to ensure our buyers that the work we are doing in Myanmar does not contribute to the conflict in Rakhine State in any way. As and when we have updates, we will let you know. I will continue to attempt some independent reporting and storytelling from the world of coffee. I have access to some phenomenal resources here in the Los Angeles area, including well-respected roasters and early access to new coffee. There has been a great deal of talk about visits to coffee farms in Nicaragua lately, for example, and I look forward to trying it when it hits the shelves (and hopefully another tasting workshop). I’ll be attending the Seattle Coffee Expo for a couple of days later in April, and a friend and colleague is attending the London Coffee Festival and will share some pictures and notes with me. I also plan to attend the Los Angeles Coffee Fest in the Summer. For this post, in addition to the Myanmar coffee workshop and discussions with Portola’s head roaster Adam Rizzo, I used the following sources for research: Coffee Quality Institute, Atlas Coffee Importers, World Coffee Research, including specific information about coffee species and varietals, Roast Magazine’s Daily Coffee News on the progress of coffee quality in Myanmar, Blue Bottle Coffee, New York Times on the genocide in Myanmar, and Britannica’s history of Myanmar.